Mark Cavendish (HTC-Highroad) strengthened his position at the top of the points classification on Sunday, winning stage 15 of the 2011 Tour de France in Montpellier. 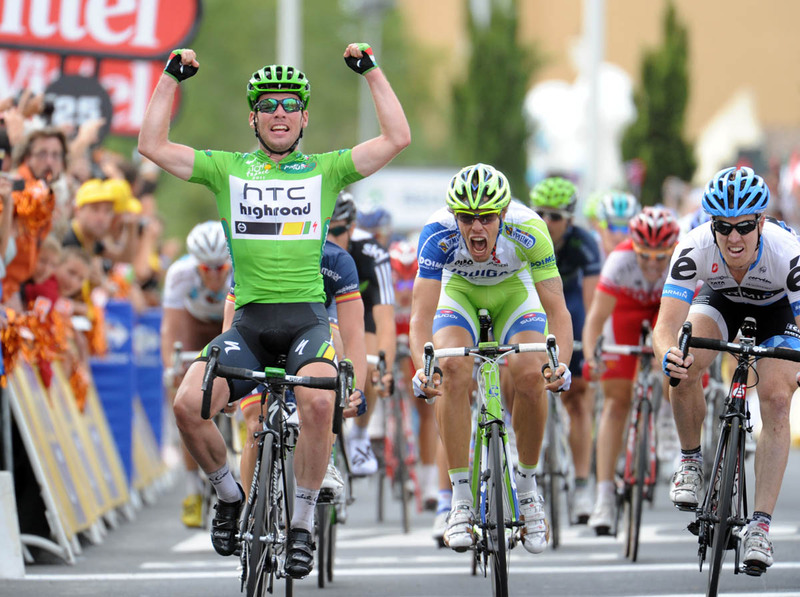 Cavendish had ear-marked the stage as his last chance of a win before the race’s finale in Paris on Sunday, July 24. The Manxman’s HTC-Highroad team led from the front, keeping a five-man escape group in easy reach and bringing their man home for his fourth 2011 Tour stage win and 19th of his career since 2008. Tyler Farrar (Garmin-Cervelo) put in a late acceleration to the line to take second, with Alessandro Petacchi (Lampre-ISD) in third. Cavendish’s closest rival in the race for the green jersey, Jose Rojas (Movistar), finished fifth. Philippe Gilbert (Omega Pharma-Lotto) failed to score any points at the finish after an unsuccessful late attack. Britain’s Ben Swift (Sky) made a bid for the stage win and came home in a creditable sixth place in what is his first Tour de France. There was no change to the upper order of the overall classification. Thomas Voeckler (Europcar) safely finished in the bunch to keep the yellow jersey after defending it with vigour in the Pyrenees. Frank Schleck (Leopard-Trek) is in second at 1-49, with Cadel Evans (BMC Racing) in third at 2-06. Five riders escaped from the peloton just 2km into today’s stage. Niki Terpstra (Quick Step), Mickael Delage (FDJ), Samuel Dumoulin (Cofidis), Mikhail Ignatiev (Katusha) and Anthony Delaplace (Saur-Sojasun) were let off the leash and soon built up a lead of around three minutes on the bunch. However, with scant opportunities for the sprinters until the final stage in Paris on Sunday, HTC-Highroad took it upon themselves to ensure that the escape group did not gain a large time advantage. High winds played their part in the early part of the stage, with a split in the bunch occurring at the 30km mark. The second group quickly regained contact with the lead section of the peloton but it made the sprinters teams even more keen to keep everything tightly under control. By the intermediate sprint point in Montagnac at 46km to go, the escapees’ advantage had shrunk to less than a minute. Delage took the honours in the sprint from the breakaway, with Cavendish beating Rojas and Gilbert to take sixth place at the head of the bunch and 10 valuable points. Gilbert had to quickly change a puncture after the sprint, and the peloton then relaxed slightly to allow the break to push their advantage back up to a minute and a half. Only Ignatiev and Terpstra remained in the escape by the time the race hit the 10km-to-go banner. Igantiev then sat up leaving Terpstra to have a solo dig. His day-long effort was ended when Gilbert launched a late attack in the final 3km. The Belgian national champ was caught as the sprinters’ lead-out trains jostled for position, and ruled himself out of the bunch gallop and will now have to work hard to wipe out the 71-point deficit to Cavendish in the points competition. HTC-Highroad again gave Cavendish the perfect lead-out, with Mark Renshaw sheltering Cav and then launching him to the line to another emphatic win and more valuable points for his bid for the green jersey in Paris. Cavendish now leads Rojas by 37 points, and Gilbert by 71 points in the points classification. On Monday the riders have their second rest day of the race before a week of action in the Alps.